Trend guru Brad Grossman gives us some pointers on how to navigate an uncertain present and move toward a better future. We’re at the midpoint of 2018 — can you believe it?! 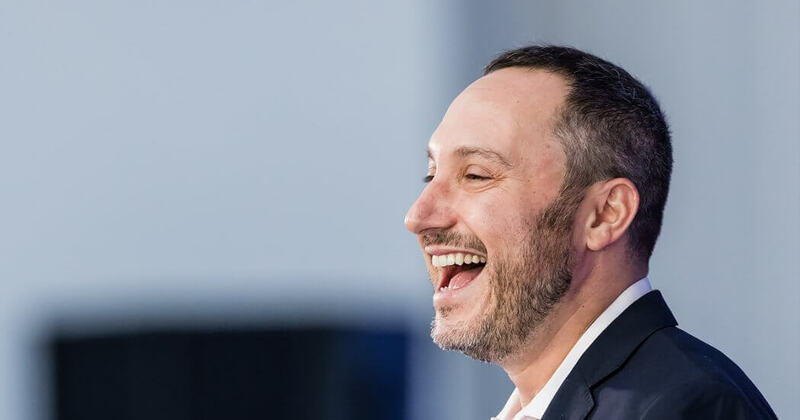 — and who better to talk to about evaluating these past months and looking forward to the rest of the year than Brad Grossman, Founder and CEO of Zeitguide. Zeitguide is an annual cultural almanac — updated quarterly — that helps CEOs stay abreast of the subjects and trends that will impact their success throughout the year. A consultant to corner offices across corporate America, media maverick, and serial entrepreneur, Grossman sat down and discussed what’s keeping business leaders up at night, what three personal attributes will give you an edge in the future, and why he thinks we find ourselves at a cultural crossroads. In the introduction to Zeitguide 2018 you say that our culture is “at a crossroads.” What do you mean? There’s a revolution happening. We’d been taking this climbing journey, thinking that everything was evolving in a positive way, especially through the Obama years. Take the example of the transgender movement here in the United States. Just look at the success of [a show like] Transparent. I asked my friend Jill Soloway, the creator of the show, “Why do you think your show is becoming so successful and why is this movement building?” She said, well, literally the Internet has enabled disenfranchised, silent people to come together and learn from each other. That same trend enabled the legalization of marijuana movement and the marriage equality movement. So, we’ve been seeing the positive. In the workplace right now, integrative hierarchies, inclusion, and diversity conversations are coming to the fore. But I’m talking about before the beginning of 2018. There has been a backlash. The best example of that is the digital paradox, and how we are finally seeing a deleterious effect from technology. We’ve learned about fake news. We have the bad effects of e-commerce, and the fact that teenage suicide in the U.S. has never been higher — many blame it on social media. We’re also hearing more about addiction. We have a piece [in Zeitguide] about nomophobia, the anxiety of being without a phone — the average American touches his or her phone 2,000 times a day! This disruption that comes with finding ourselves at a crossroads — it’s disorienting, and anxiety-producing. Does Zeitguide try to alleviate this anxiety somehow? Well, that’s a very good and very big question. I think to solve problems you need empathy, you need to understand that everybody’s going through it together. That’s one of the things that I tell my clients: have empathy for each other. How can you employ empathy when you solve problems? In Zeitguide you focus in particular on cybersecurity, naming it as something that will affect everybody from your boss to your grandmother. I read somewhere that there are three sure things in life: death, taxes, and hacks. People are aware of cyber security, but people aren’t paying attention to it. We’re all a little lazy. The crypto craze kind of amplifies this. Everybody’s curious about blockchain and what it is. Blockchain is going to be the technology that everything is based upon in the same way that there’s technology running the Internet. This new technology will hopefully be about transparency and hack-proofness and better monetization, particularly in art and music. But do you, personally, really need to know how to use it? It’s like being a CEO. There probably are some CEOs that know how to do the nitty-gritty work of coding, but blockchain might just become an off-the-shelf product, like Squarespace or AWS [Amazon Web Services]. What is the biggest competitive advantage that somebody can have nowadays? In terms of personal qualities: patience — which I don’t have! You’ve got to look at the long game. You’ve gotta be patient. Everybody wants everyone to go so fast, but ya gotta take a step back, too. That’s what we try to do at Zeitguide, connect it all from above. The second thing is curiosity. Curiosity was the foundation of my business — I started out as [US film & TV producer] Brian Grazer’s curiosity consultant. Anyone who wants to make peace with themselves moving forward is going to have to use that part of that themselves. Brian and I actually were in disagreement about this. He said that I was good at my job because I had “that curiosity,” and he believed that curiosity is something that not everybody has, that it’s an innate gift. But (and I’m seeing this now with my young nephew) when you come into this world, you’re completely curious. Curiosity is what defines children. It goes back to the question, “how do you help fix these problems?” It’s like going back to the inner kid. And add to this empathy, as I mentioned earlier. Those are very peaceful attributes. One of my goals is to have peace. We all have demons but my biggest goal is to always have peace, and that’s hard when you’re an entrepreneur or leader, and especially during times of change. One of my other goals is to practice meditation. Everybody talks about it. I understand the effects — I’ve written about it! That’s the one thing that I really want to work on as both a leader and as a human being. With everything moving so fast it’s too easy to be reactive. Ready to get started implementing Brad’s advice? Check out the list of recommended reads below: a handbook for curbing a reactive email habit, a survey of emerging technologies that will change the world, rounded off with some tips and tricks for releasing the beast of your innate creativity. Email is a technology that quickly went from delightful to draining. Glei’s book helps us all to reconsider our email habits and reorganize our lives — as well as our inboxes. Released just last year, Soonish looks at ten emerging technologies that have the potential to radically change our lives, for better or for worse. People are often divided into creative types and, well, not-so-creative types. But creativity is less mysterious than it’s made out to be. What’s more, we all have plenty to make the most of. ZEITGUIDE 2018 is an annual cultural almanac that unearths emerging trends and need-to-know hot button issues so you can stay ahead of the curve. The team synthesizes input from traditional research with the added plus of a deep network of subject-matter experts. Visit Zeitguide’s website and use the code BLINKIST to save 20% on a subscription! Like Blinkist, Zeitguide distills mountains of information to bring you exactly what you need to know. So, why not get ahead of the pack and stay up-to-speed on trends as they happen? Emily (of Blinkist newsletter fame) can confirm that she is, indeed, a very real person. A person who voices Blinkist communications, a curator who helps people find the best stuff to read, and a Martha who occasionally bakes cakes to win favor among her colleagues.